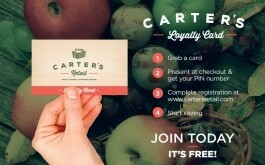 Carter’s Retail’s independently owned stores have many points of difference that separate us from our competitors. With the Carter Family working alongside our staff in our stores daily. The Carter's live and work in the communities our stores operate in. Family owned, Customer Driven is what Carter’s Retail strives to represent, the customer is always in mind for every decision that is made. Carter’s Retail currently employs over 200 South Australians with this number continuing to grow, Tim Carter has made a promise to both customers and staff promising to never install self-serve checkouts within stores to help support South Australian jobs, but also to always ensure a pleasant shopping experience for all customers. Carter's Retail are proud and feel honoured to be able to make a difference within our communities.